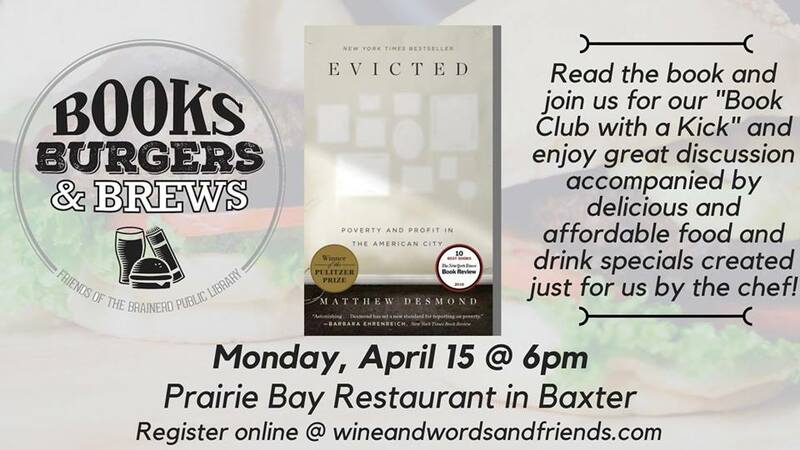 The Friends of the Brainerd Public Library are excited to partner with Prairie Bay and introduce our latest endeavor, Books Burgers and Brews. This will take place on 3rd Mondays at Prairie Bay. Join us and enjoy great discussion accompanied by delicious and affordable food and drink specials created just for us by the chef! Please be sure to register at the “Tickets Available” link so we can let Prairie Bay know how much food to prep! Our vision for this event is to attract men and women alike and provide a fun venue to gather with friends and enjoy a fun discussion. We like to call it… “A Book Club With A Kick”. Register for free at the link below, and join us at Prairie Bay. Books may be available at the Brainerd Public Library the day after the previous book’s discussion–simply ask at the front desk!